A couple of weeks ago, we were the first people to post a cover of the City High classic 'What Would You Do?' by BASTILLE. It subsequently went to the top of the Hype Machine's most popular chart, which was a pleasant surprise. BASTILLE's latest EP came out today and seeing as you can no longer get the iTunes exclusive track that came with the pre-order, we wanted to share the acoustic version of 'Laura Palmer', which you can stream below. The 'Laura Palmer' EP is the follow up to the debut BASTILLE single, the double A-sided 'Flaws'/'Icarus'. We've gone on about those tracks plenty of times - e.g here and here. 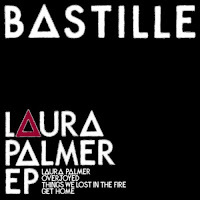 In fact, 'Laura Palmer' was one of the very first BASTILLE tracks that we heard/discussed around this time last year. The EP also features some new tracks, namely 'Overjoyed', 'Things We Lost In The Fire', and 'Get Home'. Of those tracks, I have a particular fondness for 'Overjoyed' and its sweeping melodrama. Listen to it below, along with the 'Twin Peaks'-inspired 'Laura Palmer' and its acoustic counterpart. The 'Laura Palmer' EP is out today digitally. Purchase at iTunes, amazon.co.uk etc.